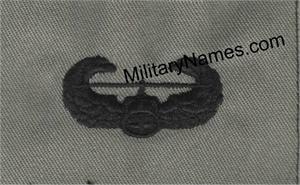 ARMY ABU QUALIFICATION BADGES Military Name Tapes & Rank Insignia. Leather Flight Badges for all Branches of Service. ARMY ABU QUALIFICATION BADGES ON SAGE GREEN MATERIAL WITH BLACK EMBROIDERY FOR THE U.S. ARMY.